Gil Gilpatrick has supervised the construction of more than 500 canoes in over 30 years of teaching Outdoor Resources in a vocational school. His friendly voice of experience addresses the novice or accomplished woodworker in easy step-by-step directions. Covering everything from safety in the boat shop to repairs, Gil thoroughly explains the whys and shortcuts learned from his experience in the shop and on the water - a Master Maine Guide, he uses his own canoes and tests their performance on the challenging Allagash and other northern rivers every summer. 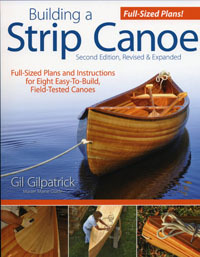 This brand new second edition of Building A Strip Canoe includes full-size plans and patterns for eight well-proven designs, most of which are Gil's own adaptations. Step-by-step directions are accompanied by more than 100 full color photographs, plus illustrations. Price: $24.95, Publisher: Fox Chapel. This new edition features Jason and Kelly Garland of Norridgewock, Maine as they work to complete their 18.5 foot White Guide Model canoe in my shop. Their canoe work was followed up by building a beautiful pair of laminated paddles to illustrate the paddle chapter of the book. Above left: Jason is carefully fitting the last few cedar strips. Above right: Jason and Kelly finishing up the fiberglassing phase of the construction. Left: Finally, the finishing touches of UV filtered polyurethane. Below: The couple pose with their new 18.5 foot White Guide model canoe - ready to launch!